Many area residents would consider the ad alone grossly inappropriate in a community that recently reached a record high suicide rate, and which has for years struggled with one of the highest suicide rates in the nation. In the U.S., the majority of suicides are by gun, and it’s been shown that depression and access to firearms are a deadly combination. Suicide rates are also higher in places where the rates of gun ownership are higher. A Harvard School of Public Health survey of all 50 U.S. states found a strong link between rates of suicide and firearm ownership. Even Fox News concluded that gun ownership is tied to a threefold increase in suicide risk. The lesson, should we choose to accept it, is that many lives would be saved if gun ownership was less prevalent. 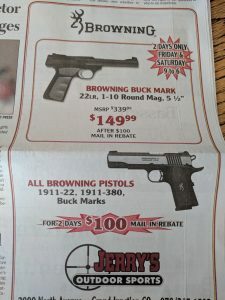 When seen through the lens of all this information, the Daily Sentinel’s ads promoting sales on guns appear thoughtless, offensive and unhelpful at best, and self-serving at worst. We know the paper wants the ad revenue, but does it have to come at the expense of potentially exacerbating the local suicide problem? While we need and value a source of local news and should be glad to have one like the Daily Sentinel, the net effect of the local paper accepting ads like this makes the paper of zero benefit to the local suicide rate, and even puts it into the negative category. In short, on the western slope, ads like this are more of a public detriment than a service or public benefit of any kind. The Daily Sentinel cannot at once be sincere in wishing community members a safe holiday while helping market cheap, deadly weapons to households across the valley. It would be more sincere — and appropriate — for the paper to refuse to run ads for firearms until the rate of gun massacres in the U.S. comes down and the suicide rate in Mesa County drops at least a little bit. What is a reasonable number of guns for a person to own? Well now, I can see where my above question might have been too tough for you guys to answer, in the context of reasonable regulation of the second amendment. So let me rephrase. Is one gun for each hand excessive? Now, you do want to have that conversation, don’t you??? This is America. You can own however many guns it takes for a guy like you to feel like a man. Well, I’m glad we got that settled. And thank you for supporting our second amendment rights. See how easy it is to find common ground? All you have to do is ask the right person. Perhaps adequate for a novice collector.